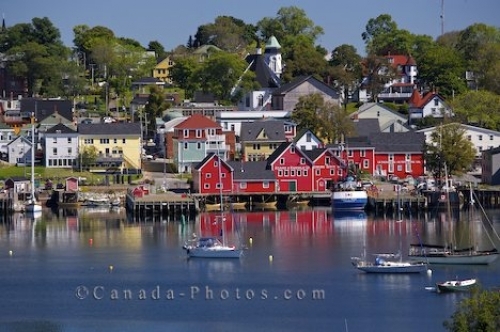 From across the water, one can see the historic, colorful buildings which make up the waterfront in the town of Lunenburg, Nova Scotia in Canada. The colorful buildings along the historic waterfront in the town of Lunenburg, Nova Scotia in Canada, a quaint town that was declared as a UNESCO World Heritage Site. The architecture in Lunenburg is incredible where churches, houses and businesses date back to the 1700 and 1800's. Lunenburg was established in 1753 as a British Colonial settlement and the waterfront is the key to its history and prosperity. Fishing and shipbuilding were the strong industries in the town and today traditional shipbuilding skills are still found here. Picture of historic buildings along the waterfront in the town of Lunenburg along the Lighthouse Route in Nova Scotia, Canada. Adams and Knickle Ltd building and town of Lunenburg, UNESCO World Heritage Site, Lunenburg Harbour, Lighthouse Route, Highway 3, Nova Scotia, Canada. Lunenburg was established in 1753.